UPDATE: There have been important changes to this program. Please visit the following links for more information. 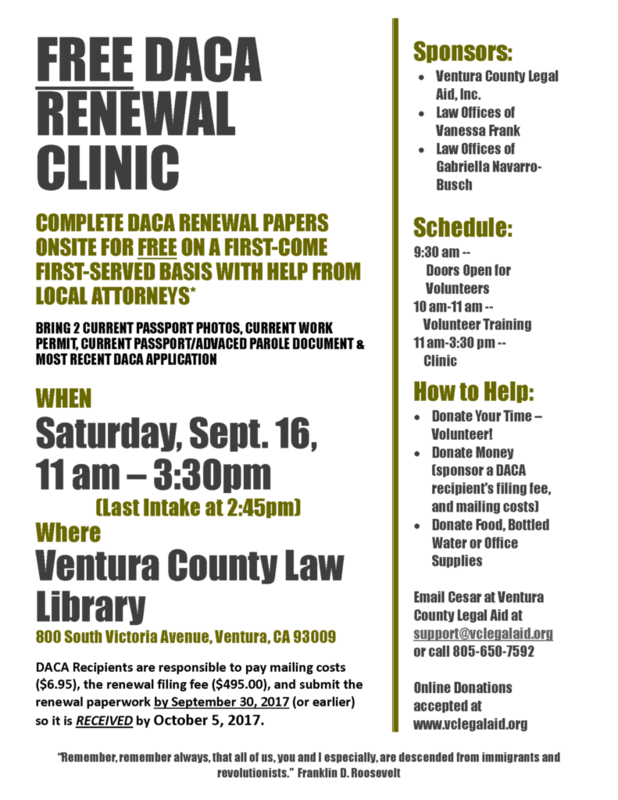 The Law Library will be hosting a FREE DACA Renewal Clinic on Saturday, September 16, 2017. This clinic is sponsored by Ventura County Legal Aid, Inc, the Law Offices of Vanessa Frank, and the Law Offices of Gabriella Navarro-Busch. This is a first-come, first-served clinic, where local attorneys will help with the paperwork for DACA renewals. This paperwork only applies to individuals who already have DACA status and whose work permits expire between September 5, 2017, and March 5, 2018. For Applicants: Doors open at 11am, final intake is 2:45pm, and the clinic closes at 3:30pm. What to Bring: 2 passport photos, current work permit, current passport/advance parole document, and most recent DACA application. Applicants will be responsible to pay mailing costs ($6.95), the renewal filing fee ($495), and submit the paperwork by September 30, 2017, or earlier, so it is receive by October 5, 2017. Questions? Contact Cesar at Ventura County Legal Aid, support@vclegalaid.org or 805-650-7592. For Attorneys: Doors open for volunteers at 9:30am. Volunteer training takes place from 10-11am. We are accepting donations to cover the renewal fee. Visit vclegalaid.org to donate. We also will accept donations of food, bottled water, and/or office supplies such as pens.